Acadian Genealogy Homepage; Acadian Regions! Established all over the municipality of Argyle and on its nearby islands, the numerous Acadian villages are located around English language communities. Having returned to their land ten years after the expulsion, the Pubnico area has remained Acadian and is a region still Acadian where there were Acadians before the explosion. The other surrounding regions include those of Wedgeport, Ste-Anne-du-Ruisseau, Surette's Island, The family names of Acadian origin include : d'Entremont, d'Eon, Surette, Boucher, Babin, Jacquard, Amirault, Muise, Boudreau, Bourque, Deveau, Doucette, Dulong, Landry, Moulaison, Pothier, Vacon, Carpora, Cottreau. Founded around 1780, then incorporated as a municipality in 1969, the village of Cap-Pélé has a population of close to 2,500 inhabitants! One particular aspect of Cap-Pélé that distinguishes it from other municipalities and makes it unique, is the operation of some thirty "Boucannières" (smoke houses) spread throughout the Village. These smoke houses are mainly used to smoke herring, which is then exported world-wide! The fishing fleet of more than 60 boats, fish for herring and scallops in the Spring, mackerel in the beginning of Summer and, from August to October, lobster. A first concession of land was granted to 14 Seniors (les 14 Vieux) in the area of Chéticamp in 1790. It was the beginning of an Acadian fishing community which has developed into a tourism industry. Situated next to what became a National Park with its magnificent mountains with its steep roads, this Acadian community presents a splendid view. The village is the start of the Cabot Trail, one of the most beautiful panoramic routes in the world. The island located along the shores and the quiet harbour add to the tranquility of the area. 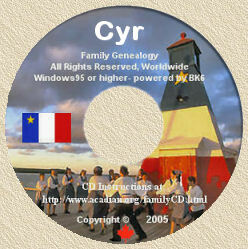 The common family names found here include the Aucoin, LeFort, Cormier, LeBlanc, Camus, Chiasson, Boudreau, Bourgeois, Deveau, Doucet, Fiset, Haché, Larade, Levert, Maillet, Muise, Poirier. In 1755, when the English came to deport the Acadians in the Annapolis Valley and destroy their homes, some Acadians fled in the woods. Some were captured and made prisoners in Halifax until 1763 with the Treaty of Paris. These settled in the Chezzetcook area. Loyalist settlers joined them shortly after, but there are still today Acadian descendants, even if many of them had left to move to Larry's River. At the return of the Acadians in the province following their expulsion in 1755, lands occupied by the Acadians in the Annapolis Valley were taken over by American Loyalists. The Nova Scotia government allowed the Acadians to return but they had to establish themselves elsewhere. Some came down along the shores of St. Mary's Bay where they established themselves to become fishers instead of farmers. Starting with their arrival at Anse-des-Blanc, numerous villages involved in fishing, lumbering, farming and boat building were established. They became the only present day municipality operating in French in the province. The families who joined the Dugas (the first) include those of Comeau, Saulnier, Gaudet, LeBlanc, Boudreau, Melanson, Amirault, Belliveau, Deveau, Blinn, Lombard, Doucet, Robichaud, Muise, Thériault, Maillet, Pothier, Thibault, Thimot, Jeddry. The Grand-Pré area situated in the Annapolis Valley area was where, before the Deportation of the Acadians in 1755, the site of most Acadian villages with its rich soil for agriculture. Today, the Grand-Pré national historic site, comprises of a chapel constructed on the site of the former St. Charles Church. The site presents the story of the prosperity of the Acadians before their expulsion elsewhere in the world. Today surrounded by Anglo-Saxons, the park presents the Acadian families who lived there. Halifax is the capital city of Nova Scotia. It was founded in 1749 by Edward Cornwallis who hoped to build a military town that could counteract the French presence at Louisbourg on Cape Breton Island. A military post, built and colonized a year later on a site opposite would evolve into the city of Dartmouth. Better known as "Chebucto" prior to 1749, the splendid harbour and basin was familiar to both the French and the English. Indeed, as early as 1607 Champlain had described it as "a very safe bay" and today it serves as the home port of the Canadian Navy operating out of the east coast. With industrial expansion at the beginning of the twentieth century, and especially during the two world wars, Halifax offered employment opportunities that appealed to many rural, and out-of- work Acadians within the province. As a consequence many moved to the city and raised their families in this urban, English-speaking environment. Some still follow that path today and are joined by other francophone people, who as enlisted men and women of the armed forces, also make Halifax/Dartmouth and region their home. Those factors combined accounts for this region having the largest concentration of French-speaking population within the province of Nova Scotia. For that fact, but also because of its central location, Halifax/Dartmouth is where the head offices of most provincial Acadian associations (including those of the Congrès) are to be found. Attractions: Neptune Theatre, three large universities, Saint Paul's Church (the oldest Anglican building in Canada), military bases, the French schools Le Carrefour du Grand-Havre, École Beaubassin and École Bois-Joli, the Citadel National Historic Site, Province House, Historic Properties, the Maritime Museum of the Atlantic and of course, plenty of shops? On the Dartmouth side of the harbour, a Collège de l'Acadie Learning Centre is located at 73 Tacoma Drive, as well, the Fédération acadienne de la Nouvelle-Écosse (FANE) is located in Dartmouth at 54 Queen street. After being deported from Grand-Pré and Chezzetcook, the Acadians who established the Larry's River/Charlos Cove/Port Felix area, even though they were isolated, were determined to stay there after being displaced several times. With its population decreasing in number because of economic situations, the villages situated along Tor Bay still comprise a significant Acadian population. We still find some families who still speak French even though they have known an important assimilation process. Despite that, the Acadians of the area maintain a strong attachment to their families and their ancestors and are proud of their French heritage. Common names in the region are Boudreau, Pellerin, Petitpas, David, Richard, Bellefontaine, Mannette, Fougère and Gerroir. Since 1774, there lies in the outskirts of the University town of Antigonish the Acadian community of Pomquet. Settled on the magnificent beach and along the shores, descendants of Acadian families are established as far as Tracadie, Heatherton, Larry's River, Charlos Cove ?, but it is the area of Pomquet which prides itself most of its Acadian origins. There is in particular the Acadian Winter Carnival which gives the occasion to the local population to manifest its pride of its French origins. Were established there the following families : Deslauriers, Doirons, Melansons, Landrys, Boudreaus, Deons, Melansons. After spending the disastrous winter of 1604-1605 on Sainte-Croix Island, De Monts and his surviving French explorers decided to move their settlement to the sheltered Annapolis Valley. There, on the northern shores of the Annapolis Basin, they built dwellings and stores in the form of a rectangle with a center courtyard and named their new habitation after Samuel de Champlain, the King's geographer on the expedition. It is here that Champlain founded the first social club in North America calling it "The Order of Good Cheer", to boost the spirits of the men during the long winter days and nights. In a spirit of friendly competition, the plan was that each member of the Order would try and out-do his predecessor in preparing a meal for the group. Fishing and hunting for game, cooking the food and then serving it with as much pomp as possible including music and dance, created positive energy and much activity, and albeit unknown at the time, reduced the cases of scurvy because of the steady consumption of fresh meat. It also served as a venue for forging strong alliances with the First Nations people as the Mi'kmaq chief Membertou and his men were often invited to participate in the festivities. Port Royal also boasts of staging the first play ever performed in North America. The Parisian lawyer/author, Marc Lescarbot, performed his "Neptune Theatre" for Champlain and his men returning to home port after an exploratory voyage along the eastern seaboard of North America. Today the Champlain Habitation at Port Royal is a reconstruction of the 1605 model. Operated as a National Historic Site by Parks Canada, it welcomes thousands of visitors each year who, upon entering its confines, are greeted by guides in period costume and carried back in time to the beginning of the 17th century. Many Acadian families established on the shores of the Annapolis River, in close proximity to the Port Royal Fort and later further up river. The survey map of 1733 gives a good description of these families and their original location along the river, referred to in the first census of Nova Scotia in 1647, as the community of Port Royal. The arrival of French fishers on the shores of Isle-Madame and the surrounding area dates back to the 17th century and even before when they arrived along the Atlantic shores to dry the plentiful fish they captured in the seas. The region eventually became known as Acadia following the establishment of these French inhabitants who were eventually expelled starting in 1755. Until the 1950's, this was the region where there were more Acadian French speaking descendants in the province. The winding roads along the Atlantic Ocean present the beauty of the area. Today, the perseverance of the Acadian population surrounded by its mostly Scottish neighbours shows that it remains proud of its French origins. The names which remain include the Samsons, Landrys, Boudreaus, Fougères, LeBlancs, Forgerons, Marchands, Benoîts, Martells, Babins, Poiriers, Richards, Thériaults, Thibeaus, Pâtés, Briands, Mombourquettes. Shediac, undisputedly the World Capital of Lobster, is a small paradise-like village located on the south-east corner of the Province of New Brunswick (near Moncton). From its beaches, one can plunge in water (North-Cumberland Strait) as warm (24 degrees Centigrade, average) as any body of water north of the Carolinas! Situated diagonally from the Provinces of Nova Scotia and Prince-Edward-Island, it is best know for its Lobster Festivals celebrated yearly in mid-July. Its Provincial Park and three mile long "Parlee Sandy Beach", offers fun for one and all! Many recognize it as the "Lobster Capitol of the World"... well, at least, one of their Tourist Bureau (made in the form of a lobster), IS! Sydney, located on the northeastern coast of Cape Breton Island, Nova Scotia was incorporated as a town in 1886. There were already several French inhabitants in Sydney, in 1752. With the arrival of the railroad, the town became more important in the naval transport industry, especially for the coal which is still mined in the area. The steel mill established in 1901 brought about an economic boom which attracted Acadians from other parts of Cape Breton. There were also many Acadian miners, in the coal industry, especially from the Chéticamp region, who had established in the surrounding area of New Waterford, Reserve Mines, Dominion, Glace Bay, North Sydney, Sydney Mines and Louisbourg. For the past nine years, the Centre scolaire Étoile de l'Acadie, has offered Acadian and Francophone students, courses in their maternal French language. The Ferry terminal service located in North Sydney provides an important link to Newfoundland and to a number of Acadian families established in that Province. Also located in Sydney is the College of Cape Breton, and the Coast Guard College. Attractions: The Miners`Museum; the National Historic Fortress of Louisbourg, consisting of 50 buildings and covering approximately 12 acres. Whales, eagles, golfers, cyclists, hikers, music lovers, history buffs, fly fishers, kayakers and travel writers all agree: a visit to Cape Breton has got to top your bucket list. The folks at Travel + Leisure magazine World's Best Awards 2009, pretty much summed it up for us naming Cape Breton the number one, must-see island to visit in North America and number three on its top islands of the world list. Hike stunning highland trails where moose and bald eagles hang around to watch people go by. Or take to the water and watch pods of Pilot whales play in the shimmering waters of the Gulf of St. Lawrence. Stroll the grassy shores or cruise to international boating destinations along the Bras d'Or Lakes Scenic Drive. Step back to the 18th century at the Fortress Louisbourg, the largest reconstruction of its kind in North America. Explore centuries-old Acadian villages. Descend to the deeps on a coal mine tour a mile beneath the ocean floor on the Fleur-de-lis and Marconi Trails and in Metro Cape Breton. Tee off on the Fabulous Foursome  a collection of four of the finest golf courses in all of Canada. And toast the day with a sip of Cape Breton Rare, Canadas only single malt whiskey, from Glenora Distillery between Mabou and Inverness. And absolutely take part in a Ceilidh wherever you find one - at a pub, a concert hall, a kitchen or out on the lawn at the Highland Village. Celtic music in North America was born here and if the musicians of Cape Breton cant get your toes tapping, you better check your pulse. The only things more beautiful than the scenery and events are the people. The "best of" lists below will help you decide what to see and do in the Cape Breton region. The southwestern most tip of Nova Scotia is renowned for its Acadian past, colourful fishing villages, towering churches and the spectacular Cape Forchu lighthouse. Yarmouth, which is about 3 hours from Halifax, is the hub of this region. Just south of Yarmouth is Argyle Township Courthouse in Tusket, the oldest courthouse in Canada, while to the north, tiny villages are overshadowed by lofty churches, such as St. Marys Church, the largest wooden church in North America. The Acadian shores have a history dating back over 400 years and contain French-speaking villages like Pubnico, which make up the oldest Acadian settlement in the province. You can explore this rich history and genealogy at Le Village Historique Acadien and Le Musée Acadien and Archives. The Festival Acadien de Clare is also a great way to experience the rich Acadian music and culture. Nova Scotia is famous for its many species of whales that can be seen not far off the coast. In this region you can take several whale watching tours off Digby Neck, kayak the Nova Scotia coastline, try some world famous Digby Scallops or simply enjoy watching the high tides along Canadas famous Bay of Fundy. The Annapolis Valley is home to the Nova Scotia wine region, famous apple orchards, farmers markets and hosts some of the most popular Nova Scotia food and wine festivals. Wine tasting tours are popular in this area and several of Canadas award winning wines are made locally. Peggy's Cove is one of the most unique, captivating and exhilirating eye-openers in Nova Scotia. The quaint seaside hamlets of Shad Bay, Big Lake, East Dover and West Dover, to mention but a few are also breathtaking. Known as Canada's most famous fishing village, Peggy's Cove, with it's famous glacier rocks, offers an attraction that predates the stone age. As well, visitors can see the only post office in North America that is located in a lighthouse. We stop here for approximately 30 minutes and if the fun is overwhelming you can stay and enjoy a delicious fish chowder and/or a nice cold beer. EVANGELINE ---"A TALE OF THE ACADIE" is a poem by an American. The poet Henry W. Longfellow wrote this poem during the Second World War and it has come to symbolize a story about lost love between the young Evangeline betrothal to her lover, Gabriel, and the subsequent separation as The British deported The Acadians from the province of Nova Scotia in 1755. This is one of the epic love stories that reduce most of our clients to tears at it's conclusion. The great explusion in 1755, The Canadian government helped build a memorial park i the Grand Pre area. A fascinating tour which explains the remarkable and resilient spirit of The Acadians, we will visit the presumed site of the original deportation and you will feel the eerie of how families were torn apart. The full Cajun story will never be told fully without visiting the Grand Pre. You can spend a great deal of time exploring and reflecting on the grounds of the museum. Tour the areas known today as Wolfville. Stop at an eatry for a quick Cajun lunch. Seeking unspoilt natural beauty and romance? This is where you'll find it!